Swooshing downhill, side by side, Kate Middleton and Prince William show that their relationship is definitely on the up. 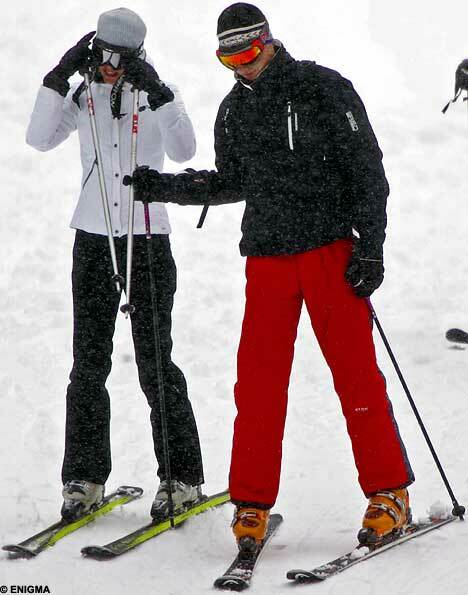 A playful Miss Middleton even gave her chap a tap with her ski pole as they descended the Alpine slopes. That has not deterred 26-year-old Miss Middleton, who confidently tackled some challenging off-piste runs before enjoying a romantic lunch with William in a chalet high in the mountains. Their obvious closeness puts paid to mischievous rumours that their four-year relationship is on the rocks again following their temporary split last year. The reality, friends say, is that their romance is stronger than ever. The pair are due to be joined in Switzerland later in the week by Prince Charles, further cementing Miss Middleton's growing confidence at the heart of the Royal Family. A source close to William told the Daily Mail: "His father sees Kate often and has become very fond of her. It is going to be a real family holiday." Dang - girl looks skinny. How one can look so trim in snow/ski gear is beyond me. She does not look 26!!!! !